A white Limousine will pick you up at your Hotel in Waikiki and transport you to your Wedding location at Waialae Beach Park. The Minister and Photographer will meet there for your Wedding and Photo shooting. Afterwards catch the sunset and more photos at Magic Island. Includes our Photographer with 150+ high-resolution photos on CD, and a DVD Photo Slideshow with romantic music background. You may have your Wedding Ceremony at either Waialae Beach or at Magic Island, and a photo session at the other location. For the best lighting at Waialae Beach, we recommend having your Wedding (or photo shoot) earlier in the day, such as at 1:00 or 2:00pm. That gives us a beautiful blue sky in the pictures, weather permitting. Then you can return to your hotel for a break, and change into some more casual clothes if you prefer for your sunset photos. An hour before sunset we will pick you up at your hotel and bring you to Magic Island for your sunset photos. Your guests may accompany you to one or both locations. Older guests may wish to rest at the hotel while you are at your photo shoot. Those interested in our 2-Beach Wedding may want to see our 7-beach Wedding, visiting Waialae Beach Park, Kawaikui, Makapu'u, Waimanalo, Kailua Beach, Lanikai, and Magic Island. 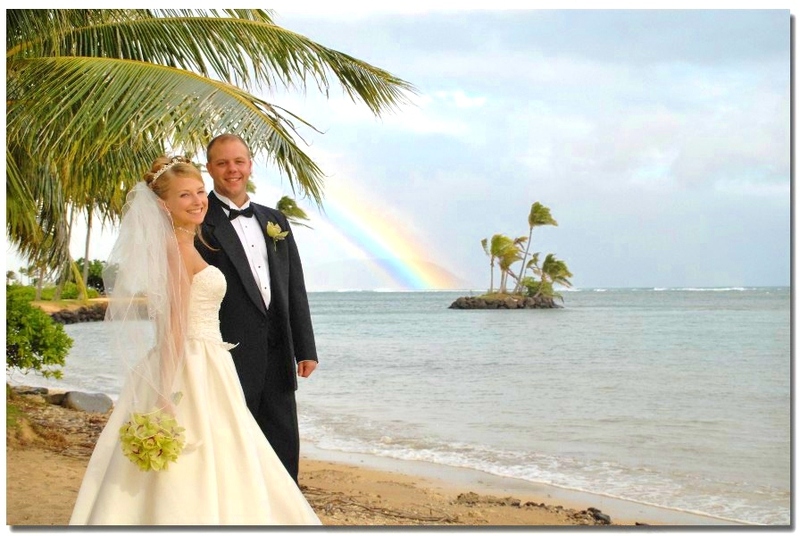 We also recommend our 2-Island Wedding, visiting Waialae Beach Park on Oahu, and more honeymoon photos on the island of MAUI!